Coconut oil is the oil content extracted from coconut kernel. Its oil is equally in demand just as other coconut products such as coconut water and meat (kernel); and indeed, is the chief source of cooking oil consumed in many South-east and East Asian regions. Additionally, it also found wider applications in the traditional medicines, and as a carrier oil in pharmaceutical industries. Cocos nucifera (coconut palm) belongs to the large Palmaceae family of palm trees. Oil of coconut. Note for clear, light yellow oil. Photo: Phu Thinh Co. Coconuts in a Cocus nucifera palm. The coconut palm is an unbranched, erect, tall-growing tree. In a season, a single coconut palm can yield 20-150 mature nuts. The fruit is almost spherical to oval in shape and measure between 5-10 inches in width. Initially, its rough outer husk is light green which turns gray as the nut matures. The husk is about 1-2 inches in thickness and made of tough fibers. Underneath this husk, is a woody-hard shell enclosing an edible kernel (endosperm), known as "coconut meat." 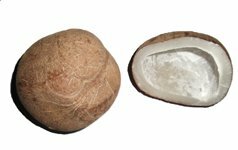 When this nut ultimately matures and dries to become “copra," it is employed in pressing coconut oil. Coconut oil composes of more than 85% of saturated fats. The majority of saturated fats are the medium-chain triglycerides (MCT's) of which lauric acid being the dominant fatty acid. It is this lauric acid which gives coconut oil its white cream color in its stable (solid) state. Cold pressed virgin coconut oil (VCO) features light-yellow color and has pleasant coconut flavor and sweet taste. Its specific gravity @ 25 °C is 0.917–0.919, Iodine value-7.5–10.5, and saponification value-251–263. Its fatty acids profile, however, makes it as one of the most debated edible oils regarding health benefits. Coconut oil composes of saturated, mono-unsaturated and polyunsaturated fatty acids (SFA: MUFA: PUFA) at a ratio of 86.5: 5.8: 1.8 fats. A significant portion of its saturated fats, however, fall into the group of medium-chain triglycerides (MCT’s ranging from 6-12 carbon atoms). Chief MCT’s in this oil are lauric acid (C-12), capric acid (C-10), caprylic acid (C-8) and caproic acid (C-6). Together, they constitute about 68% of total saturated and 59% of the total fat content. Lauric acid, being a 12-carbon saturated fat, represents the major portion of MCTs. 100 g fresh coconut oil contains 44.6 g of lauric acid, constituting more than 45% of the total fat content. In the gut, lauric acid and other MCT's absorbed directly into the bloodstream without any barriers and thus save energy and induce an early sense of satiety. Additionally, MCTs help increase blood HDL or good cholesterol levels in the blood. Despite of its high saturated fats composition, coconut oil characteristically has its own set of health benefits. MCT's absorb passively and enter the blood system inside the gut without any mediation of transport channels. Several research studies suggest that these fats help reach early satiety and increase blood HDL/total cholesterol levels. Lauric acid, and other MCT's absorbed passively into the blood stream, and thus save energy and bring a quick sense of satiety. Such qualities of coconut oil strongly commended by some nutrition scientists like Mary Gertrude Enig who is among the frontline advocaters of health benefits of saturated fats. When consumed in moderation over a period, saturated fats, mainly medium-chain triglycerides, may help reduce body weight and may cut down the risk of atherosclerosis and CAD. Cold-pressed oil contains a small amount of vitamin-E, and other tocopherols. 100 g fresh oil composes of 0.19 mcg of vitamin-E.
European food safety authority (EFSA) stepping further, opined that “saturated fats are synthesized inside the human body and not required in the diet. Therefore, no Population Reference Intake (PRI), Average Requirement (AR), Lower Threshold Intake (LTI), or Adequate Intake (AI) is set.” Most European countries advise their population not to exceed 10% of total calories from saturated fats. Studies suggest that there exist a positive correlation between saturated fats and blood LDL cholesterol levels. Substituting saturated fats with polyunsaturated (PUFA) fats has shown a gradual decline in the serum triglyceride and LDL-cholesterol levels. Coconut oil is very high in saturated fats (>90%). Studies suggest that there is a clear correlation between coronary artery disease (CAD) and coconut oil consumption, particularly in the exotic (non-native), mainland inhabitants of temperate regions of the world. The traditional native coastline (seashore) population who eat, drink, cook food prepared of coconut may not have shown significant health problems when compared to non-traditional (for instance, US citizen) population. Further, traditional coconut oil consuming population uses it with, say fish (they cook fresh fish with coconut milk, oil, etc.) and eat lots of locally available, seasonal vegetables, and fruits (coastline Indian, Malaysian, Polynesians, Indonesian, Philippines). If you advise a US citizen to roast, cook or fry everything that already high in saturated fat (say steak) with coconut oil, then itsconsequences on health would, otherwise, prove to be perilous! Commercially available cooking coconut oil is most often double-filtered and hydrogenated in order to avoid it turn rancid (which is one of the reasons why it appears stable at room temperatures like lard or butter). Coconut oil (Cocos nucifera), Nutritional value per 100 g.
Dry coconut or copra (cut sections). Renewed interest among consumers in the applications of coconut oil has prompted import of this otherwise foreign (exotic) food oil into the USA from several Asian regions. Several grades and categories of oil, for instance; cold-pressed virgin, double-filtered, RBD oil (refined, bleached and deodorized), hydrogenated, solidified-butter, etc. can be readily available in the US stores. Cooking coconut oil sold in tin containers or inside plastic cans. While buying, look for freshness, and methods employed in its extraction. Since RBD oil contains no free-fatty acids and volatile short-chain fatty acids, it is clear, has a neutral flavor, and possesses long shelf life. Certain manufacturing units claim cold processed oil features some degree of anti-inflammatory, anti-bacterial properties. At home, store virgin coconut oil inside the refrigerator since it retains some bio-enzymes and free-fatty acids after cold-processing to prevent it turn rancid. RBD oil may stay well for longer periods kept at a cool, dry place away from a humid area. Despite being a high saturated fats food item, coconut oil is employed in daily cooking in many parts of the world. Native inhabitants of Polynesia, Micronesian, some South-East Asian regions, and the southern part of India (Kerala state) use it exclusively in cooking. Its use is fast spreading to other regions especially, in the US and Europe. Coconut oil appears as clear liquid at temperatures above 25 °C. It attains a gel-like consistency at a temperature below 25°C, thickens below 21°C, and solidifies below 14°C. Fresh, virgin coconut oil (VCO) has pleasant, nutty aroma and sweet taste. It used exclusively as cooking oil in many countries to fry, roast, sauteing, dressing, etc. Its high smoke point helps for deep-frying food items, including vegetables, meat, and poultry. Coconut oil also used in the preparation of vegetable shortening. Coconut shortening has found favor especially in children confectionaries like desserts, crackles, pastries, biscuits, etc. Coconut oil, like that of coconuts, is safe to use in infants and the pregnant woman. Allergic reactions and intolerance to coconut oil as food are rare. (Medical Disclaimer). <<- Coconut water nutrition facts. <<-Back to Dietary oils and fats from Coconut oil nutrition. The Weston A. Price Foundation- A new look at coconut oil.